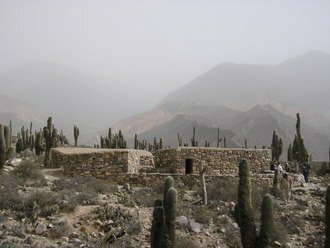 The Quebrada de Humahuaca has been populated for over 6,000 years, yet success spawned jealousies among rival settlements. Construction of the El Pukara began in approxamately the year 500. The Quechua built this fortified hill town, with a sprawling maze of structures, in solid stone including streets and The Quebrada de Humahuaca has been populated for over 6,000 years, yet success spawned jealousies among rival settlements. 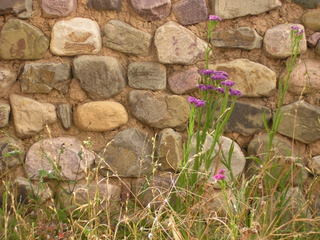 Construction of the El Pukara began in approxamately the year 500 . The Quechua built this fortified hill town, with a sprawling maze of structures, in solid stone, including streets, and protected walled fields for agriculture and grazing. In the early 1500's, the Inca Empire subdued the Pukara, and added their temple to the Sun - introducing the tradition of human sacrifice and reinforcing a rigid socio-economic organization that provided a stable standard of living, rare in world history. Spanish conquest forced the abandonment of the Pukara and residents drifted back to the river lowlands and into a life of servitude to their new overlords. In the 1930‘s, archeologist from the University of Buenos Aires began decades of excavations and restorations. 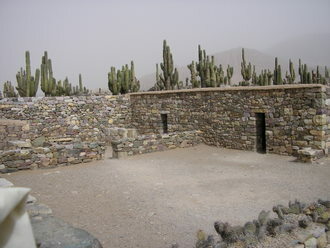 Today El Pukara is a national historic site administered by the University. On the grounds is a botanical garden using irrigation canals constructed centuries ago that still provide some of the water supply. The garden highlights the ecosystem of the Quebrada de Humahuaca. 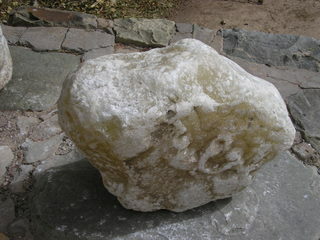 Sculptures within the garden are made from native minerals such as Onyx. Stalls outside the entrance to El Pukara sell some high level crafts. Entrance fee is AR$10 (US$2.65).